As you must have noticed, when we come up with the line-up for Old Grave Fest, we always try to get bands that have never played here, as much as possible. But when we heard the first couple of tracks from Obliteration's new album (Cenotaph Obscure, just out on Indie Records) we just knew we had to get them back to Bucharest. We've been waiting for ages, it seems, to be able to use words like "haunting", "sinister" or "eerie" without them being euphemisms for "riff-less". Cenotaph Obscure is both chock-full of riffs and gloomy enough to make your skin crawl, worth every day of the five year wait. We could wax lyrical for ages about the ever warping riffs and the everything but the kitchen sink approach to drumming, but we'd prefer you get the record and spin it one or twenty times. And get a ticket to Old Grave Fest, of course. For those of you who have been living under a rock, Obliteration is a death metal band hailing from Kolbotn, the hub for all things metal near Oslo. Since taking up that name fifteen years ago, they've been putting out some of the best stuff in their genre while also developing their own, instantly recognizable sound. Perpetual Decay (2007) is perhaps the most indicative of the band's initial influences, Slayer to Autopsy via Morbid Angel and everything in between, but there's already enough meat on the bones to see the potential of something really unique. And that something would be fully unleashed in the following full length record, Nekropsalms (2009) - let's just say it's not just the album cover that makes it not your average, run-of-the-mill piece of death metal. Things would only get better, or, should we say, more evil: Black Death Horizon (2013) uses the full arsenal from fast-paced thrashy riffs to dirge-like ultra heavy passages, in a package that would be very hard to top. Until now. 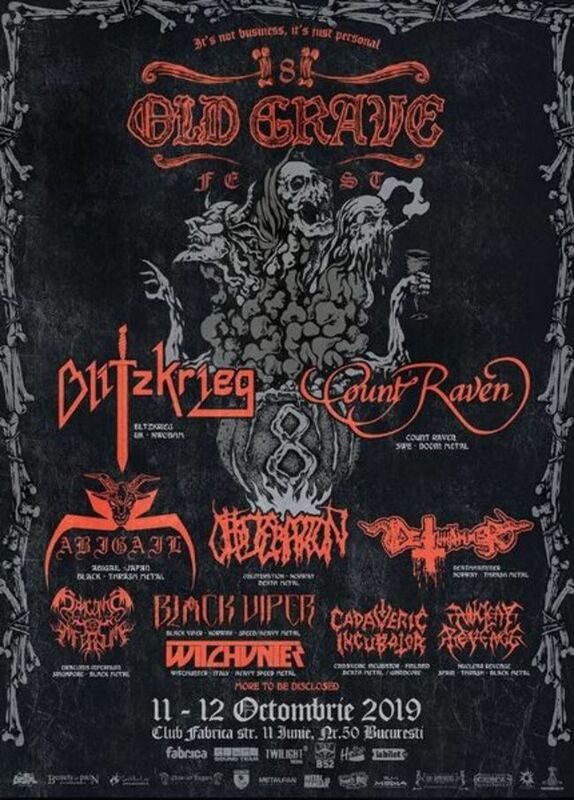 Four years after their first and only live mayhem in Romania, Norway's thrashers Deathhammer will be back with a vengeance (and a brand new album), this time at Old Grave Fest. Spawned from the pure Wrath of the Antichrist in 2005, Deathhammer immediately started its Barbaric Onslaught and 14 years and four full-length albums later these Phantom Knights continue to Forever Ripping Fast in their Savage Poser Hunt, leading the underground Onward to the Pits of Nekrothrash with the Evil Power of old school metal - and all this while still remaining Chained to Hell. Consistent in their viciousness, they're invoking with disgusting riffs and rabid vocals a spirit that also haunted the early masterpieces of such mythological monsters as Slayer, Destruction or Venom. Their relentless speed and demonic mercilessness will undoubtedly assure a delayed onset muscle soreness even for the most seasoned headbangers. We’ve never had a death/grind band at Old Grave so we knew we had to change that. Of course, we couldn’t just get any old band, but one that put out one of the most exciting releases in later years, Cadaveric Incubator from Finland! Cadaveric Incubator was formed in 2005 by Necroterror (bass/vocals) and Humiliator (guitar/vocals) with the aim was to create old school disgusting sounds influenced by bands like early Carcass, Repulsion, or Mortician. But after just one released demo - Resurgence of Morbidity - the band split up in 2007. 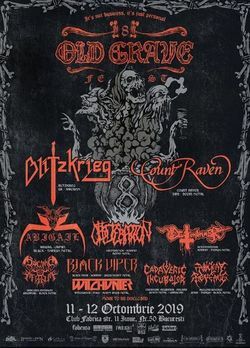 In 2014, Necroterror resurrected Cadaveric Incubator by teaming up with his old comrade Pentele, who he had know from the early 90’s scene, when Necroterror played in his the death metal band, Excrement, and Pentele was drumming for Carnifex and Festerday. Original founding member Humiliator joined as well and the new demo Unburied Abominations was recorded. The band finally recorded 12 tracks in early 2016 for their debut album, the excellent Sermons of the Devouring Dead, that was released by Hell’s Headbangers Records in 2017. As far as we know, it will be their first time anywhere near Romania, so this can’t be missed!